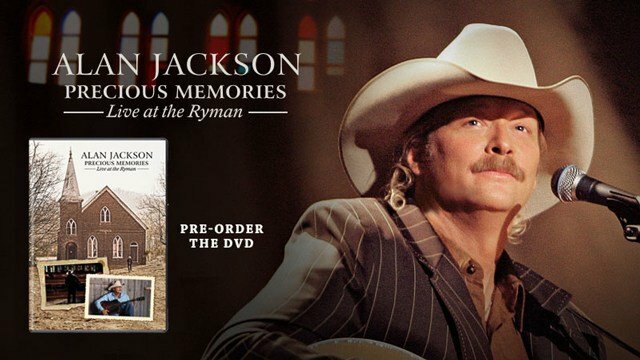 Taped live at the historic Ryman Auditorium, “The Mother Church Of Country Music,” in Nashville, Tennessee, Alan Jackson delivers a powerful performance featuring songs from his very personal release “Precious Memories.” The program also includes exclusive interview with Alan, his mother, and wife, as he reflects on his musical roots. Fans of “The Gaither Gospel Hour” will thoroughly enjoy this epic performance of many beloved gospel favorites by one of country music’s biggest stars. Alan Jackson is one of the most successful and respected singer-songwriters in the music business. He has sold nearly 60-million albums worldwide, topped the country singles charts 35 times, and scored more than 50 Top-10 hits. He is a 17-time ACM Award winner, a 16-time CMA Award recipient, and a two-time Grammy-honored artist whose songwriting has earned him the prestigious ASCAP Founders Award and an induction into the Nashville Songwriters Hall of Fame as a 2011 Songwriter/Artist inductee. Jackson has written or co-written 24 of his 35 #1 hit singles, placing him in the elite company of such sing-songwriters as John Lennon and Paul McCartney, who’ve written more than 20 songs that they've also recorded themselves and taken to the top of the charts. Pre-order your copy of this show now from Gaither Music!